This summer my oldest daughter, Savannah, stepped out of her comfort zone to try something new. She participated in a week-long soccer camp in a nearby town. She is the quiet one of our two girls, so it was a big step for her to go there, as she didn't know anyone and never played soccer for recreation before. My husband is from El Salvador and loves soccer, and had hopes that one of his children would take up the game. 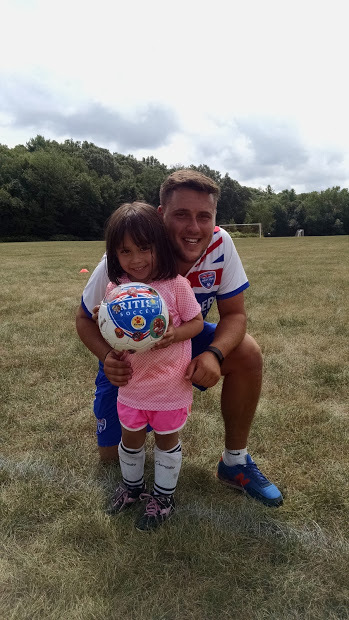 Knowing how much her Daddy likes soccer, Savannah said she wanted to learn to play so that they could play together in the backyard. So, for one whole week, the hottest one all summer with temps in the 90's all day, she learned the game of soccer, made a couple new friends and even scored a goal. I loved watching Savannah's face light up when she was running back and forth kicking the wall, right up until she scored a goal. But, I think the best part was that her Daddy was there to see her play and score a goal. While she set out to learn the game to be able to spend more one-on-one time with her Daddy, Savannah also grew as a person. She got over her fears, tried something new and had a blast. When you ask Savannah what her favorite summer memory is, she will talk your ear off about how Coach Dan taught her how to play soccer, and how her Daddy was all smiles watching her play. While Savannah may not become a pro soccer player, she is a star in her Daddy's eye. :-) And, whenever there is a soccer match on television or a movie about soccer, Savannah gets in as much snuggle time with her Daddy, as they taught about the game, yell "GOAL" together and just enjoy each other's company. They don't stay little forever. So, when I was asked to review a new family-friendly Dove approved movie, "Golden Shoes" recently, I jumped at the opportunity. This movie, which was a hit at our house, is about a little boy named Christian Larou, who dreamed of becoming a great soccer player. But, with a family missing in action at war and a mother laying in a hospital bed in critical condition after a car accident, Christian is left feeling alone and without a purpose. He is not sure if he will ever see his father again and worries about his mother. 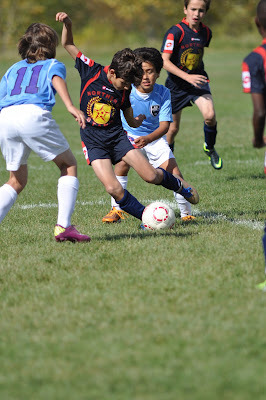 But, thanks to soccer and a pair of "magic" golden shoes, he takes the field as part of a local youth soccer league. The coach doesn't think he is any good and he gets bullied by the other kids. It isn't until he steps on the field with his golden shoes and is given the soccer ball, that he proves everyone, including himself, just how great a soccer player he is. "Written and directed by Lance Kawas (Fractured), Golden Shoes, the Dove-family-approved movie for ages 12+, arrives on Digital HD from Starz Digital Sept. 25 and on DVD and On Demand Oct. 6 from Anchor Bay Entertainment. Christian Koza (Fractured) overcomes numerous obstacles to achieve his dream of becoming a great soccer player in this inspirational film, also starring Dina Meyer (Starship Troopers), Eric Roberts (The Dark Night, “Heroes”), David DeLuise (“The Wizards of Waverly Place”), talk show host Montel Williams, Aedin Mincks (“A.N.T. Farm”), with Vivica A. Fox (Kill Bill Vol. 1, Independence Day) and John Rhys-Davies (The Lord of the Rings franchise, Raiders of the Lost Ark). Golden Shoes will be available for the suggested retail price of $19.98. To learn more about the film, please visit www.goldenshoesmovie.com." Thanks to the folks at Anchor Bay Entertainment, one lucky reader will win a copy of this new family-friendly film, along with a soccer ball. To enter, please complete the entries on the Rafflecopter form below. Good luck! We just watched Home and it we all enjoyed it!